When considering music lessons, some parents seek the most convenient options, such as the proverbial piano teacher next door. 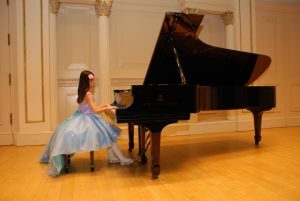 While this is understandable, so many parents have come back to us, saying “I wish I had gotten a start at the Chopin Academy from the very beginning.” Having the right start from the very beginning is essential, rather than waste time and money on the wrong teacher and setting, and involving a difficult retraining due to firmly instilled habits. Private lessons at the Chopin Academy of Music involves one-on-one sessions between the student and a master teacher. The most traditional way to learn to play an instrument, the private lesson is the core aspect that comprises studies in music. In private weekly lessons, students will learn the skills that they will refine in daily practice at home. Students may select one of the available instructors, who will take a personal approach to planning and guiding each student on a case by case basis, customizing the best plan of action for the individual. He or she assigns the material for daily practice, introduces new material during lessons, and monitors the student’s technique to ensure that proper development to posture, position, physical freedom, and other fundamental aspects are carefully followed. No teacher has a “set method” of approach for all students. Daily practice from lesson to lesson (which are usually weekly lessons) is crucial in order to make forward progress. Students may also opt for three levels of private lessons. Basic, or GENERAL TRACK (the default for most students), lessons for fun and enrichment is the default for beginning students, and perfectly suitable for more advanced as well who do not wish to pursue the goals of frequent performances and competitions. The EXAM TRACK program prepares students with a strong core skills approach, including mandatory technical exercises and studies, as well selections from each of the various style periods of music (Baroque, Classical, Romantic, etc.). Exam track students prepare for semi-annual juried exams in January and May at the Academy in front of several faculty members, receiving feedback for their progress and improvement. The last level of private lessons is the COMPETITION PREPARATION PROGRAM, in which students may focus on the requirements for specific competitions, festivals, and performances throughout the year. For those registered in this third program, two lessons per week are required along with a group activity. For either basic or exam track program students, only one lesson per week is required. Students may take private lessons in durations of 30, 45, or 60 minutes. In addition to private lessons, students can supplement their music studies with regular group classes in theory and ear training. More information can be found on the “Classes” page.